The majority of stainless steel tubing and wire sold by Vita Needle Company falls in the 300 series stainless steel family. The composition of the stainless steel tubing varies depending on the alloy, but in general stainless can be an effective solution for many different types of applications. The key element in stainless steel is chromium, which when alloyed with the remaining elements, permits formation of a microscopically thin, passive layer on the surface of the metal which resists oxidation (rusting). This invisible layer is consistently self repairing in a normal environment---in other words, if the tubing surface is damaged, the layer reforms to protect the underlying tubing from oxidation. The condition of this layer on the surface of the tubing can be enhanced by a process known as passivation, which removes free iron and contaminants from the surface of tubing that might otherwise limit or reduce the formation of the passive layer. However, under exposure to certain environments, the self-repairing nature of the passive layer can be reduced, depending on the alloy and external factors. 304 / 304 L: The most common 300 stainless series alloy, good corrosion resistance, cold working characteristics and relative cost effectiveness make this our most popular alloy. The "L" grade version has a lower carbon content for reduced carbide precipitation during secondary welding operations. 17-7: The addition of aluminum in this alloy provides improved tube strength and hardness while maintaining good corrosion resistance. Can be heat treated to a higher tensile strength than can be achieved by cold work alone. 302: Very similar corrosion resistance to stainless 304, but higher strength due to carbon content. Typically not available in tubing, wire/solid only. 321: Increased strength and corrosion resistance, especially at higher temperatures, are characteristics of this alloy due to the addition of titanium to the base metal. 316 / 316 L / 316 LVM: The addition of molybdenum to the base metal improves corrosion resistance for use in medical / food service and other demanding tubing applications. "L" grade is a low carbon version for reduced carbide precipitation during secondary welding operations. 316 LVM is melted in a vacuum to reduce impurities and and create a uniform chemistry. 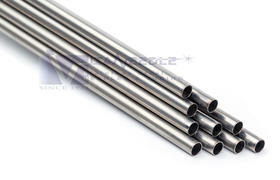 303: An ideal stainless steel alloy for machining parts due to the addition of elements which reduce tool wear / expense. Available for machined parts only, not offered as tubing. 347: Characteristics are similar to 321, but the addition of several alloys allows tubing to withstand high temperatures for longer periods. Aluminum 3000 & 6000 series: Lightweight, cost effective and easy to form, Aluminum is popular for a variety of applications including aerospace and industrial. Brass 260: Composed of 70% Copper and the balance Zinc, this very ductile metal can be used in corrosive environments for a wide variation of applications from appliance parts and ammunition cartridge cases to ornamental hardware. Additional alloys available upon request. 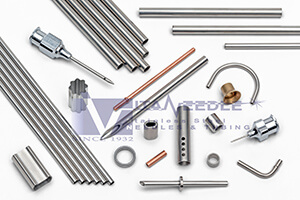 Vita Needle also carries high nickel alloy small diameter tubing for your specialty needs. 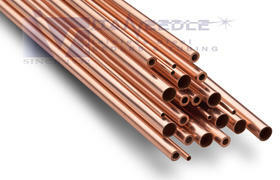 Vita Needle Co. carries small diameter copper tubing in alloys of C102 and C122. Didn’t find what you’re looking for? Please contact us for custom items or additional product information.